Nato defence ministers have dismissed talk of a crisis over its operation in Afghanistan, saying the alliance was making good progress in the country. 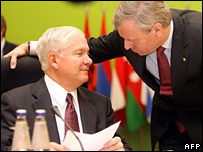 US Defence Secretary Robert Gates said he was encouraged by what he had heard from European states about upping their contributions at talks in Lithuania. But despite the show of solidarity none of the members promised more troops. Earlier, Afghan President Hamid Karzai played down tensions over the role of foreign states operating there. Speaking after meeting visiting US Secretary of State Condoleezza Rice and UK Foreign Secretary David Miliband in Kabul, Mr Karzai defended his leadership and denied he had criticised the UK's contribution in the war against the Taleban. Relations have been strained since his assertion last month that, in spite of the UK's efforts in the province, the situation had worsened in Helmand. He also rejected the British candidate for the top UN job in Afghanistan, Paddy Ashdown. Mr Miliband said the Taleban were being defeated but that it was a long-term job, while Ms Rice insisted things were moving forward though still "not complete". A Taleban spokesman dismissed the prospect of increased troop numbers in the south, saying it would not make the Nato presence any more effective. At their meeting in the Lithuanian capital, Vilnius, Nato defence ministers insisted that the Nato-led International Security Assistance Force (Isaf) was not failing in Afghanistan and that the alliance was not falling apart. Emerging from the talks, Nato Secretary General Jaap de Hoop Scheffer said he had been substantially encouraged by the progress made in the country. "The picture leads me to tell you that I am cautiously optimistic, that there are challenges, that indeed we need more forces... and that our presence in Afghanistan means sharing responsibilities and also sharing risks," he said. Mr Gates insisted the debate over whether Nato's European member states were providing sufficient combat troops to southern Afghanistan had been overblown, and that he had been encouraged by what he had head. "I don't think that there's a crisis, I don't think that there's a risk of failure," Mr Gates said. "My view is that it represents potentially the opportunity to make further progress faster in Afghanistan, if we had more forces there." On Wednesday, Mr Gates warned the future of Nato was at risk due to differences over Afghanistan and that it might become a "two-tiered alliance". He said that without more sharing of the burden of counter-insurgency, the willingness of those engaged in combat would disappear. Most of the fighting in the volatile south of the country is being done by the US, UK, Canada and the Netherlands. Major US allies such as Germany, France, Spain, Turkey and Italy have refused to send significant numbers of combat forces there. But despite the divisions over how the burden for fighting is shared, all the ministers in Vilnius made clear they were committed for the long-term. UK Defence Secretary Des Browne emphasised the need for patience and that the work of his country's forces in Helmand was welcomed by both the Afghan people and President Karzai. "I am absolutely certain that he appreciates the contribution that we have made," Mr Browne said. "We will move forward together because improving the Afghan government's ability to deliver for its own people is at the heart of what we need to do." BBC defence correspondent Caroline Wyatt says that the real test of all this optimism will come in April at the Nato summit in Bucharest, when the alliance will find out which countries will live up to their commitments. 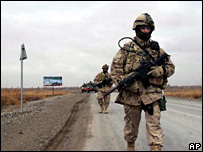 Canada has warned it will pull its contingent of 2,500 troops out of the country next year unless allies provide reinforcements in Kandahar province. At the Vilnius talks, Canadian Defence Minister Peter MacKay stressed he wanted Nato members to pledge to provide the reinforcements by April. "It's not a negotiable item. We need 1,000 troops," he said. "We have to deliver on that commitment before we can extend our mission." No nations publicly announced a decision to increase their troop numbers at the meeting, however, though French Defence Minister Herve Morin confirmed Paris was considering a greater role in Afghanistan. "My message to the Canadian public is: be a bit patient," he said. On Wednesday, Germany announced it would send a 200-strong rapid reaction force to northern Afghanistan, but said they would not be deployed in the south except in an emergency.